Virgin Atlantic: Fly from Stockholm to Seattle from €282! Hainan Airlines are one of few 5-star airlines in the world ranked by Skytrax. They are connecting Chinese cities with various cities in Europe, America and Australia on about 110 routes. In Europe you can consider their service when departing from London, Manchester, Paris, Brussels, Berlin, Prague or Milan. How to apply Hainan Airlines promotion code. : To take the advantage of this voucher code you need to follow below special link. Simply choose your country and enter your email address. Once done special Hainan promo code will be generates. Just copy paste and use this code during booking process. Then, once making your next booking just use this Hainan discount code in last step “Purchase”. You will find there separate box “Promotion code”. Enter the code you have received and click on proceed. Your next flight will be automatically discounted! To take the advantage of this Hainan Airlines promo code you need to make your purchase by 31st of December 2017. Travel period is then from now till 30th of June 2018. The coupon can only be used for ticket purchases on Hainan Airlines official overseas website. Each coupon code can only be used once for one order. If there are several ticket bookings in one order, the discount will be applied to an adult ticket. 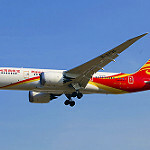 Promotion codes can only be used on tickets purchased for flights originating in France (specifically Paris) where Hainan Airlines is the operating carrier. All flight segments shall be operated by Hainan Airlines. The coupon code is not applicable to flights operated in conjunction with other airlines or code-share flights. Booking sample of successfully applies Hainan Airlines promotion code: save on all flights £50 / €50 / $50 or its equivalent! You would depart from Brussels to Shangai on 8th of December. Your return flight from this Asian city in China back to Europe would be then on 22nd of December 2017. In this case you would easily save €50 just be using this Hainan Airlines promo voucher code. You would pay total €367.86 for a round-trip ticket. Considering this is a non-stop service on board of 5-star Hainan Airlines this is excellent opportunity for travelers not only in Belgium..